I write this from my sofa on Sunday afternoon; it's been a few weeks since I had a Sunday off but today it is very much needed. I worked a 13hr shift yesterday (for those of you who don't know I am a wedding co-ordinator at a Hotel) The final picture is of me, the GM who is actually my cousin and of the Head Chef when we were 12 hours in - we're smiling because we've passed exhausted and have reached delerium. One thing for sure is that I absolutely take my hat off to all the Doctors/ Consultants and Nurses who do these shift day in and day out - I am still tired today. Cousin waiting outside school for her on Tuesday. 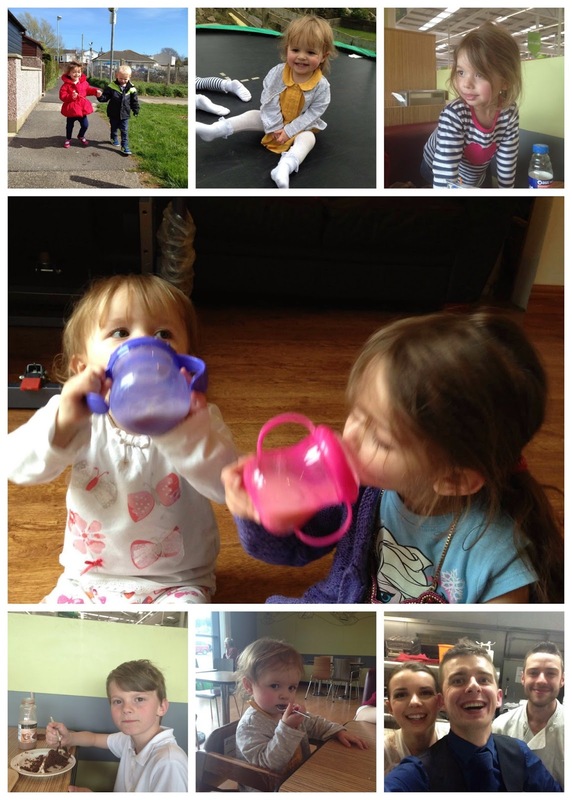 My Mam was ill at the beginning of the weeks and it was Wednesday before we saw her this week, this was the longest we've been without seeing each other in years, she made us a Curry for dinner that night, the main picture is of Martha Grace and Isabella Nicole sitting nicely together enjoying a cup of tea. We had a playdate with friends on Friday and Martha Grace absolutely loved playing on Cai's trampoline. Then after collecting Osh from school we headed to Asda so I could do the weekly shop, the kids aren't daft either so of course we had to make a stop at the cafe for some cake before we did the shop - not that I needed to be persuaded to take the kids for cake. I am now going to see if my concentration will let me cook a roast dinner (something I haven't done in weeks) The chicken is already in the oven and the house smells amazing with it.